The holidays are fast approaching and I can't believe it. The leaves have changed colors and are falling rapidly off the trees. It seems like I looked and blinked and an entire year just just flew by, and my now little girl is not so little anymore. I've been going through photos of past Christmases and I can see the growth that has taken place throughout the year. As most of you know, I grew up in the Caribbean and I never experienced snow until we moved to the United States. Christmas for us meant cotton dresses and tees and we were even able to wear shorts as well, because it was summer all year round. Now fast forward to today, and I have children of my own and they need different wardrobes for each season including the holidays. The holidays for me means photos with Santa, food and spending time with family. I recently went to OshKosh B'gosh to find Madison's holiday outfit for the holiday season and I was not disappointed. When it comes to kids fashion, I know that OshKosh B'gosh has me covered. You may also know that I lived in New York City after migrating to the US and recently moved to Colorado. I know most of you think that Colorado must be horribly cold because it's known as "ski country" but you couldn't be further from the truth. I live in Colorado Springs, where if you don't like the weather, just wait 5 minutes and it'll change. So it can be difficult at times to "dress for the weather". When it comes to Madison, I love to layer. It's always easier to take off a piece of clothing than to add something later on. 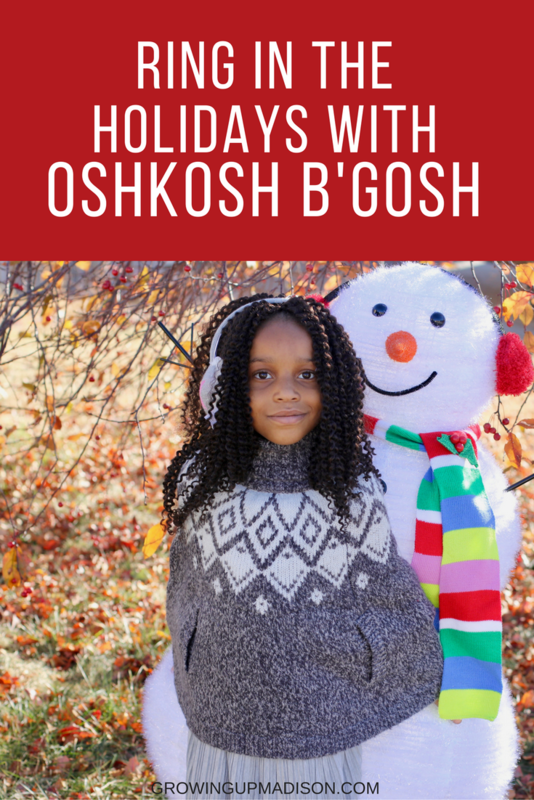 So I knew that when I went to OshKosh B'gosh I was going to look for something that I could layer, and also something that can work not just for photos with Santa, but something that she can wear to our holiday dinner. 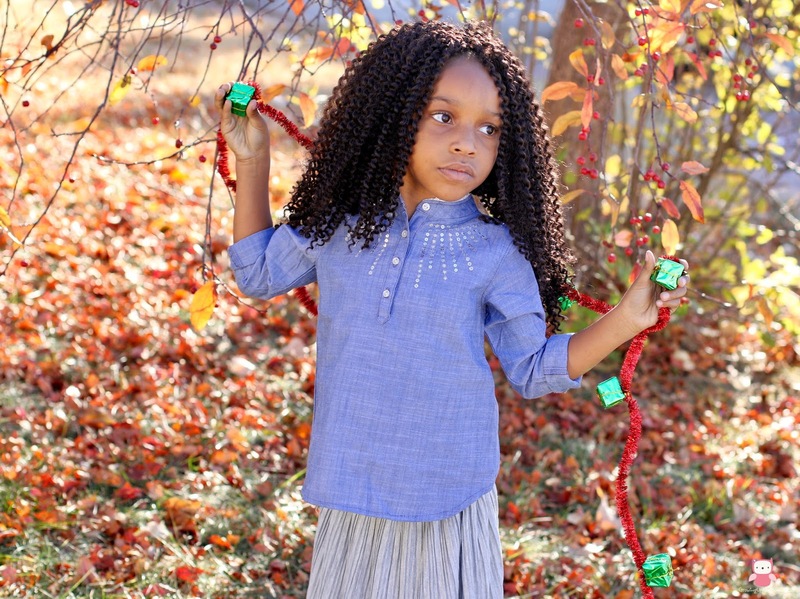 I chose the Sparkle Chambray Top because of it's casual look, but loved the ruffle detail and the sparkly embellishments that also said "holidays". I then added the pleated skirt which also has the sparkle waistband, and while it's totally girly, it can be dressed up or down with a pair of tights. To layer, I added the Sparkle Fair Isle Poncho. Now I just love ponchos, but I especially love the Fair Isle designs because of the holiday flair it brings. To add a pop of color I added the pink Sparkle Flats. I'm not a fan of shoes with heels for a pre-schoolers, and this was more appropriate for her age. Now for this I could have gone with either the black or white tights and I love that OshKosh B'gosh sold them in pairs, so it made my final decision easy since I had choices. 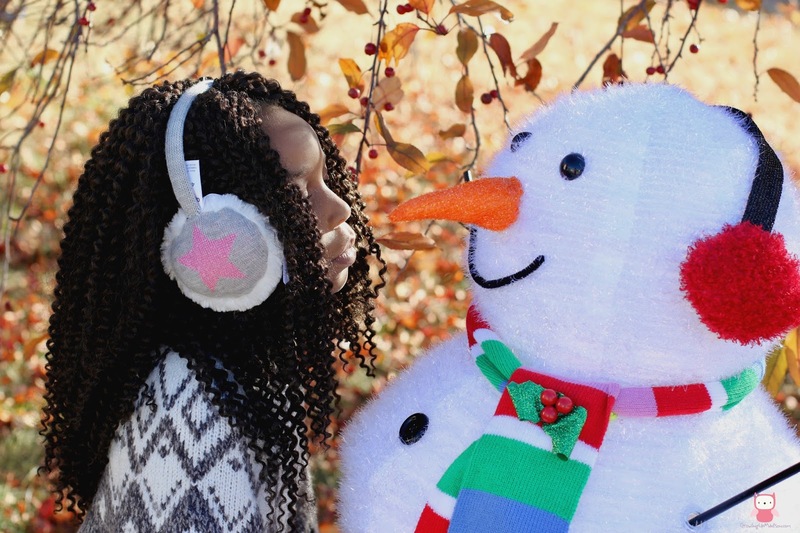 Since I wanted to show off Madison's curls, I decided to get the Faux Fur Sparkle Star Ear Muffs instead of a hat. It'll keep her ears warm and looked amazing! Now, while I'm highlighting what I purchased for Madison, there is so much more available in store, and it's not just for girls either. OshKosh B'gosh is available for both boys and girls, from newborn to age 14, and their clothing is affordable and made to last. So whether you're looking for clothing for the holidays, or just something casual for everyday wear. OshKosh B'gosh has just what you need. To find your nearest OshKosh B’gosh store use their store locator or you can also just shop online. To make your shopping even sweeter, I have a coupon that you can use for your purchases in store or online – Online: OKBG3223 and Retail 036108. Just click on the photo below and print to use in store. What are you most looking forward to for the holidays? 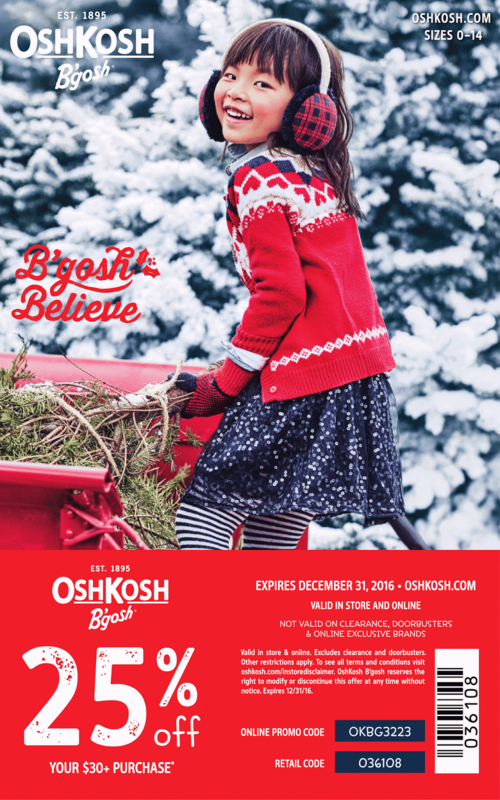 And to get ready for your own holiday shopping, enter for your chance to win a $50 OshKosh B’Gosh gift card. Winner will be randomly selected by promosimple and will have 48hrs to respond to the winning email. Failure to do so will mean forfeiting your prize and a new winner will be chosen. Good luck! I am looking forward to time spent with family. I am looking forward to being with my family on the holidays. Looking forward to my mom coming to town!! My family is 8 hours away and this is our first year to spend Christmas with them since E was born - I can't wait! My grandmother just turned 90 and is doing great, but I feel it's important to make the most of this year with her! Oh my gosh! I always loved they style of Oshkosh, but they've really upped their game. That's high fashion for kids! These are such great look for kids. And your daughter is a perfect model for them. This is one of my favorite brands for my kids. You daughter looks super cute in their new line. I love dolling up my daughter with new winter clothes. Super cute outfits! My daughter would love those shoes! I am most looking forward to spending quality time with family these holidays! I remember my mom used to shop there for me when I was about your daughters age and always loved the quality and options they had! I hope y'all have a wonderful holiday season! I love that little cape! I grew up in weather similar to what you've described Colorado to be, it's difficult to dress appropriately and cute! That is such a cute outfit. I loved to shop at Oshkosh when my son was little. We love shopping at Osh Kosh. They have so many cute kids clothes and they are at such great prices too. 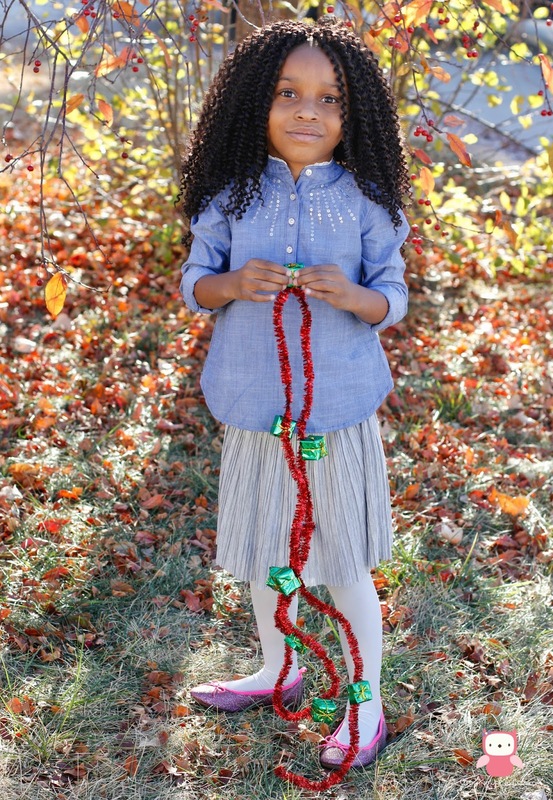 Osh Kosh makes the cutest holiday outfits! I am most looking forward to the family dinners. Getting to see some relatives I only see a couple times a year. These outfits are so adorable and how can you handle how gorgeous she is?! Love OshKosh! And their reputation really shows how great a brand they are! Happy (almost) holidays..
Oshkosh has a lot of good and stylish outfit for kids! These outfits are fashionable and my daughter will surely love it. I love these clothes! I didn't know they made bigger sizes. I'm absolutely loving the new outfit you put together. OshKosh B'Gosh was always one of our favorite stores for updating the kids' wardrobes. OMG Madison looks so cute n these clothes. I mia the days of dressing my son up. Now at 16 he shops for himself. As for the holidays i am looking forward to baking. It's my favorite thing to do. I absolutely adore that silver-grey pleated skirt. I would even wear that myself! I wish they made these clothes in my size! They're absolutely adorable. I'm most looking forward to spending time with family and friends and of course, Hallmark Christmas movies! I love all those outfits!! So perfect for the holidays and they are such Good quality too! Those shoes and that cape are just too sweet! I am really looking forward to spending time with my family! That's such an adorable outfit! I just bought something for my friends' there. Osh Kosh is my favorite place to shop for my kids! What a beautiful girl you have! And we LOVE OshKosh. They always have adorable options! Oshkosh has been around for so long. There quality of clothing is great. These outfits are so cute! This is a great deal. Oshkosh is a great quality brand of kids clothes. Oshkosh never fails to impress! I only have one child left who can still fit their clothing and you best believe he will be getting new clothes from Oshkosh this Holiday Season! Love the cape. My daughter would love to wear it along with the skirt. I love Osh Kosh clothes. We shop there whenI go to the outlets. These outfit are so cute! Perfect for the holidays! Would be a great gift for little girls too! 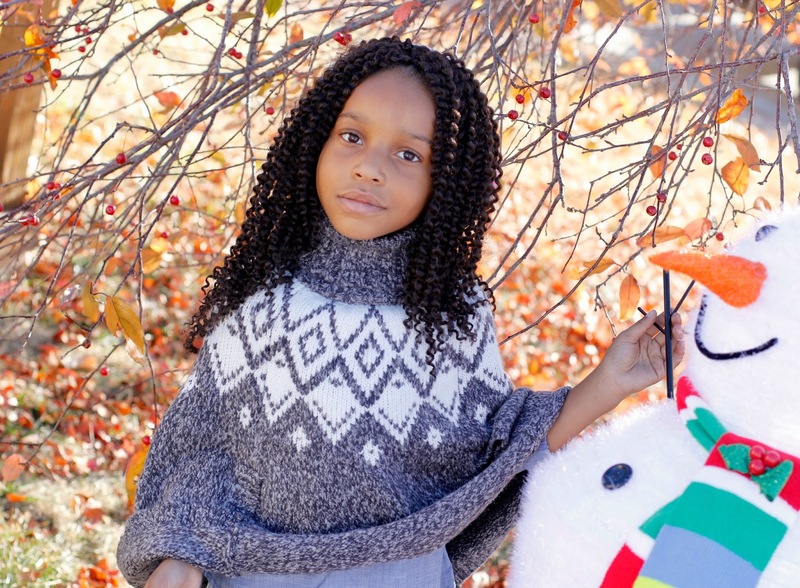 awww such lovely items and perfect for the colder weather and the holidays! We love OshKosh in this house too so going to have to check it out! I am most looking forward to spending time with my parents. I don't get to see them as much as I would like to! Your daughter is such a cute! Her outfit is also cute and fashionable. I bet this to my niece. Oshkosh has a lot of cute outfits for kids! This would be also great gift idea. I loved OshKosh for my kids when they were younger! One of my favorite lines of clothing for the younger set because of their excellent quality! My (31) daughter loved OshKosh, especially when they made cute pink overalls. Dang nab it, hit enter too soon! I used to pair those up with some pink Roos (shoes) and she was just plain adorable. I'm looking forward to moving into my new house this winter, praise God! Couldn't come a moment too soon. These are so stinking cute!!! i LOVE THE PONCHO look for little girls! Those pictures are too much!!! They look like an ad! OshKosh is our favorite place. We have a local store in the hills of the Berkshires. You can't beat that. I love it from September - January. 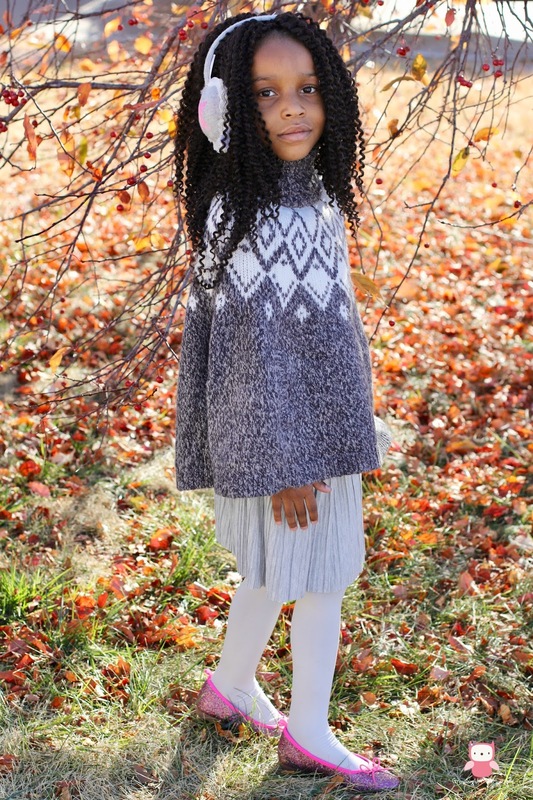 I love it year-round, but there's something about winter kid clothes! I love how well it matches within itself. We love Osh Kosh in our house! Their products are the best and so cute! Osh Kosh is amazing and how cute is she? I love their blue jean products...so cute! She looks stylish and comfortable. I've got a trip to Osh Kosh planned because our son has outgrown almost ALL of his pants! I'm looking forward to a lot of things over the holiday season. It's the one time of year we get to see family, and we get egg nog too! Omg I'm loving that sweater!!!! My parents use to dress me in OshGosh! I almost forgot that they existed lol. Beautiful choices! I just love OshKosh clothes for the kids. We used to buy all of their holiday clothing there. And PJ's year round. To be honest, I'm looking forward to the food. Lol! My mom tends to go crazy with the cooking which means goodie bags for me. I like the selections you chose. She looks awesome. Osh Kosh has been one of our faves for as long as I can remember. Oh my gosh their clothes are TOO CUTE. As a kid my mom loved dressing me in Oshkosh (early 90s) so I am so glad to see they are going as strong as ever. My mother in law has like 4 pairs of oshkosh overalls saved for my future children. OshKosh makes the cutest items...I love the great quality too! Your daughter looks adorable! That little cape is so perfect! I love it! What cute clothing options for kids! I love Osh Kosh! That little girl is so precious. The clothes look great too. High quality and perfect for the season! I am looking forward to seeing my 6 grandchildren open up their presents. I"m mostly looking forward to going to visit my sister and her family for the holidays! I'm looking forward to spending time with family and friends. I enjoy getting together with loved ones during the holidays. It's fun to gather around food and enjoy laughter together. I look forward to all of the Christmas lights! I'm looking forward to spending time at home with my family and bonding with my newborn. Looking forward to family time and food.